I let my kids talk me into chickens, and now I am addicted. The red one is Ruby and she was our favorite. March 31, my silkie hen was broody (again) so I decided to let her sit on some eggs. I candled at day 10 and had 5 out of 6! Whoo Hoo. If it wern't for BYC, I wouldn't have had any clue how to do any of these things. Here is our first hatchling. Hatched on day 22-we were so excited! We hatched another one this morning on day 23. It looks just like the first one. Guess I am going to have some more Silver Spangled Hamburgs. My Roo is beautiful! Hope they get some of his looks. I just sold 7 Silver Hamburgs and bought 2 Cochins and a Maran. 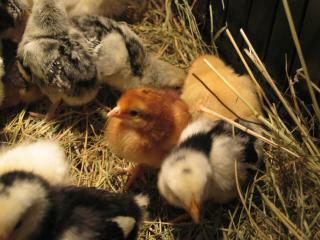 The next day I went and bought 6 buff orpingtons and 4 Barred Rock. This morning I went to get more EE and Silver laced Wydonttes. Earlier I was reading a thread about chicken math. It was funny and you know we all do it. So, I thought I would record my method of doing equations that justify my overflowing coop. As you know, I sold all of my Silver Hamburgs, thus bringing my chicken total down to 18. When I went to do my nightly coop count, I was kinda sad to see so many empty spaces on the perch. With a heavy heart, I told myself that was just how it was going to be. We had a very hard winter in Iowa and the feed bill was crazy with 25 birds. I kept telling myself that I wanted a smaller flock! And, I failed miserably with that mantra. Next I started saying, 25 is the perfect number to have. I started browsing chicken breeds I would like to "someday" add. Enter TSC. My son's birthday week, we decied to go visit our local tractor supply company. It was chick week, need I say more? Yes? Ok. They had 4 water tanks of peeping fuzzy butts, and we couldn't resist. I told my kids that they could buy 6 at the MOST. Our journey to TSC was 2 kids, 1 adult. Our return journey was 2 kids, 1 (insane/addicted) adult and 5 buff orpingtons, 4 barred rocks and 1 red chicken that my daughter just had to have. The manager at TSC was SO helpful, and told us that they were getting EEs and wyandottes the next week. So, the math status is now 18 + 10=28. I told my hubby 20. See, the math is already working. 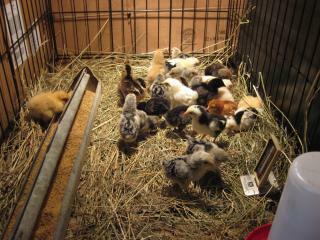 The next week I added 2 EEs and 2 golden laced wyandotts. 28 + 4=20. Yep, chicken math at it's best. If you read the above passages, you will note that my silkie hatched out two babies (silver hambergs-oh the irony) so now the math is 32+2=30. I just couldn't be that far off in my calculations. 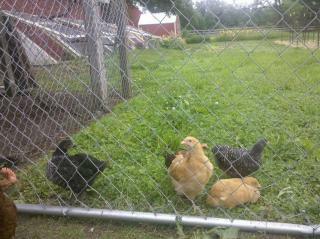 I also saw an ad on craigslist for cochins and went and picked up two cochins AND a maran. So again time to do some math. 32+3=30 YIKES I own 30 chickens?!? I took myself firmly in hand and said, "self, no more, you have to stop!" 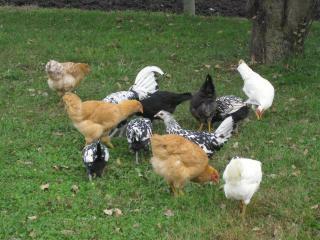 Totally committed to stopping, I settled my heart on my 30 chickens and headed out to the coop to check on them. When I entered the backyard, I noticed my neighbor standing there. I had talked to her the day before about getting her own chickens. I don't know her very well, and thought it was strange that she was out by the coop instead of ringing the doorbell. Anyway I noticed that she was carrying a chicken! I was so excited. I thought she was starting her own flock-wrong! Seems that her daughter found this particlar chicken (partridge cochin) running around, downtown Des Moines in a parking lot. It took her daugher and a friend about 45 minutes to catch the chicken. ( Boy do I want to see that video footage) She brought it to her mom who knew a lady who would take it. Of course that lady was me. You know, the crazy neighbor who raises lots of chickens. Like 30 is a lot? We are now proud owners of one partridge cochin named Fudge Stripe. Let's do the math. 35+1=25. 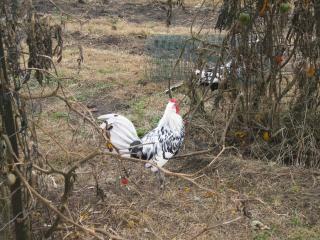 Backyard farms is now at it's chicken capacity of 25 chickens. This, I feel is the perfect number.